We’re back with another installment of Nest Digest. Denmark is a quiet place, therefore a mouse finding a piece of cheese is usually considered news of national importance. During the many slow news days I collect front page articles from Denmark’s two free newspapers – MetroXpress and 24Timer. I then bring you this urgent news, because the world must know! Oh, you poor misled soul. Not only do you use silly words like “shenanigans”, you also have missed the point of this story entirely. This isn’t about dressing physically making you ill. 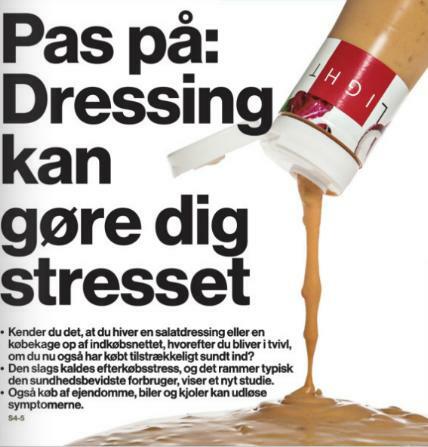 This is about health-conscious people stressing over their food choices after buying dressing. So say one day Søren Stressensen goes out to buy himself some nice vegetables to make a salad. He figures, “Hey, you know what’s good with salad? Salad dressing!” (Søren’s smart). So he picks up some salad dressing to go with those delicious tomatoes, spinach and marinated plums (Søren’s disgusting). However, when he gets home, something happens to Søren. He can no longer sleep, he cannot eat, all he can do is agonize over buying that damn dressing. He should have known better. He knew dressing wasn’t good for him, but he bought it anyways. That night Søren is permanently confined to a mental institution, his last human words being: “Dressing kills! Free Tibet! Also, barbarabarlabaBRABA!”. OK so I’m exaggerating a bit (Søren doesn’t actually know of Tibet). But the newspaper really wants us to believe it’s a major issue plaguing Denmark. They have dedicated two whole pages inside the newspaper to the issue of dressing stress, complete with consumer interviews, related stories and expert opinions. What did your sandwich HAVE on it??? Oh my it’s stressing me out! hahaha My maternal great grandmother originated in Copenhagen. She came to New York on a ship. I use the word “Shenanigans” but THAT came from my father’s Irish ancestors. 😉 Hello from the U.S. I enjoy your sense of humor. I can’t reveal that important sandwich twist…you’ll just have to read the newspapers! Hi back from Denmark and thanks – I’m happy you’re enjoying the humour. Thanks for swinging by! When I read the title of this post I thought it was going to be about stressing over putting one’s clothes on, but this is a lot more interesting. And relevant, I would say. Reminds me of my hometown Newspaper, the Times Herald, affectionately know as The Times Horrible. Ha, you must share some stories from The TImes Horrible then – I doubt they’d beat these world-shattering news from Denmark! Well, we wouldn’t want anyone’s head imploding, could get messy. That’s awesome! Freshly pressed for the third time, no? You should not worry – you have facts and reason on your side. And I kind of hope Vlad shows up, would be fun to chat with him about dragons again!